The Milwaukee M12 Fuel Stubby Impact Wrench packs a lot of power into a relatively small package. It's going to do its best work in the automotive environment, but there are a lot of tasks it's well-suited for MRO crews and on the construction site as well. New Milwaukee M12 Fuel Stubby Impact Wrench models are making waves in both the PTR office and in the industry. It’s more than just the fact that these impact wrenches are coming out on the M12 battery platform. 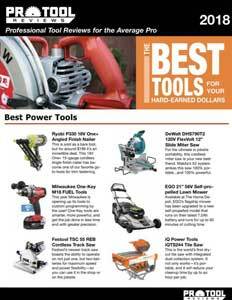 Milwaukee is claiming that these are the most powerful 12V impact wrenches available. Not only that, but they’re also the industry’s first cordless stubby impact wrenches. So what qualifies them as the most powerful? The 3/8″ and 1/2″ models boast 250 foot-pounds of nut-busting torque. The 1/4″ model drops down to 100 foot-pounds to protect the smaller drive size. 4-Mode Drive Control isn’t terribly complex to understand, but it’s very helpful. You have 3 standard modes that increase speed and torque as you move up. The 4th mode shuts the tool down before you overtighten a fastener and risk shearing off the head. Ditching the hose in favor of a battery is part of the appeal. The other side of that coin is the stubby design. At 4.8″ to 5.1″, you’ll be able to get your Milwaukee M12 Fuel Stubby Impact Wrench in those tighter areas easily – which is the whole reason to get a stubby in the first place. Stubby impact wrenches live most of their lives in the automotive world, but I’m going to let Tim Johnson over at Shop Tool Reviews apply his expertise there. What I want to know is whether the M12 Fuel Stubby has a place on construction job sites. We got our hands on the 2555 – the 1/2″ friction ring model. But this part of the review is just as applicable for the 3/8″ version as well since it has the same amount of power. I really like the M12 Fuel Stubby Impact Wrench as a replacement for your 18V 3/8″ impact wrench. It’s going to give you more power than your impact driver for socket applications while keeping the weight and profile much smaller than a standard 18V impact wrench. Where it fits best in my book is on fasteners like timber screws and lag screws – jobs that might push your impact driver harder than you should but don’t really need all the force a mid-torque impact wrench delivers. Of course, there are all sorts of other nuts and bolts you come across throughout the day as well. Similar to how a 12V drill can handle 80% of your drilling and driving needs, this stubby impact wrench tackles a surprising number of socket jobs on your plate. It also has a lot of potential for MRO crews. The 2555 we’re testing runs $159 as a bare tool and $249 as a kit. That’s the same as the 2554 (3/8″) and 2555P (1/2″ pin detent). Something like the M18 Fuel Compact Impact Wrench (2754) will have a similar amount of power with a larger footprint and higher weight. That particular model is the same price as a bare tool, but $10 more for a 2.0 Ah battery kit and $329 with 5.0 Ah batteries. The value proposition really boils down to whether the weight and size savings are a big deal to you and if you don’t mind having M12 batteries in addition to your M18 packs. If you already have some M12 tools, this is a nice addition to your system. If you’re not, it will bring a new battery platform into play, but there are an awful lot of great products on the M12 line worth getting into it for. The Milwaukee M12 Fuel Stubby Impact Wrench packs a lot of power into a relatively small package. It’s going to do its best work in the automotive environment, but there are a lot of tasks it’s well-suited for MRO crews and on the construction site as well. Includes: M12 FUEL Stubby 1/4″ Impact Wrench, (1) M12 REDLITHIUM XC 4.0 Battery Pack, (1) M12 REDLITHIUM 2.0 Battery Pack, Multi-Voltage Charger and case. Includes: M12 FUEL Stubby 3/8″ Impact Wrench, (1) M12 REDLITHIUM XC 4.0 Battery Pack, (1) M12 REDLITHIUM 2.0 Battery Pack, Multi-Voltage Charger and case. Includes: M12 FUEL Stubby 1/2″ Impact Wrench, (1) M12 REDLITHIUM XC 4.0 Battery Pack, (1) M12 REDLITHIUM 2.0 Battery Pack, Multi-Voltage Charger and case. Includes: M12 FUEL Stubby 1/2″ Pin Detent Impact Wrench, (1) M12 REDLITHIUM XC 4.0 Battery Pack, (1) M12 REDLITHIUM 2.0 Battery Pack, Multi-Voltage Charger and case. With the four modes, is there any reason in normal usage (excluding mode 4) not to always use mode 3 as it supplies the most torque and RPM? Does mode 3 drain the battery significantly faster than modes 1 and 2? I havent used mine much but so far it’s been amazing. Need this in my life. Like quick like. It would have been nice of you guys to not cover the tool with your description. Geez, lol. What is the release date on the M12 FUEL 3/8” Stubby Impact Wrench 2554?